There’s a reason why Cuisinart CJE 1000 5-Speed Juice Extractor is the Best Value Juicer of 2019. If you’ll check the specs of this machine, it’s comparable to a Breville BJE510XL but it’s way cheaper. It’s half the price to be exact. Not to mention that it comes with superior warranty. Alright, so let’s get into the details. This machine is a centrifugal juicer equipped with a powerful 1000-watt motor with five adjustable speed setting. The control dial features an attractive blue LED light ring. It provides a smooth transition giving you total control over your juicing speed. Not only was the design of this high quality juicer intended to be sleek and sophisticated, but also it was specifically designed to effectively juice soft and hard produce alike. The three-inch feed spout accommodates for larger produce and comes with an adjustable drip flow spout—eliminating drips and spills. Entirely constructed of die-cast, stainless steel housing, this heavy-duty juicer only weighs 15 pounds. The parts of this electric juicer are entirely BPA-free. It features an exclusive easy unlock and lift system. In addition, the highly effective foam management filter disk separates the froth from the juice. A one-liter juice pitcher and a two-liter pulp container are included with the juicer. The filter basket and cutting disk made entirely from stainless steel. When pitted against other centrifugal juicers on the market, it operates quickly and at lower noise levels. Since this juicing machine is solely for juicing, it is quite simple to put together and operate. All of the components fit nicely together. Make sure the juice ejector spout is open prior to juicing. It is important to never place objects other than the food pusher down into the feed chute. While it juices anything easily, some items need preparation. Once everything is ready, simply drop it down the chute. The chute is wide, but you will not be able to place an entire apple down the tube. Cut it into quarter pieces for the best results. Remove the pits and skin from produce that you would not normally consume. As long as the produce is prepared accordingly, it works fast to extract nutritious and savory juice. Since it works quickly, it will produce your juice in less than a couple of minutes. Cuisinart CJE-1000 must be cleaned right after usage, it is a quick and simple process. Although, the parts of the juicer are dishwasher safe, cleaning it by hand ensures that you get everything out of the little nooks and crannies that a dishwasher might miss. Submerge everything in hot, soapy water. Use the bristle brush to remove the pulp from the micromesh filter basket. Wash everything, rinse, and set everything out to dry. It literally takes less than five minutes to clean everything. If you are going to wash it later, simply rinse, and place the parts to the side. Just be certain to clean the filter basket. Otherwise, the pulp will harden, and become stuck in the tiny holes. Just remember, if you clean it immediately, everything will come off instantly. The quality of the juice produced by this fast juicer is good, especially considering it is a centrifugal juicer, but it is not going to be the same quality as the juice you extract with a masticating juicer. The yield of juice produced does not disappoint and is comparable to more expensive centrifugal juice extractors on the market. Depending on what you juice and the speed you juice it, you may end up with some foam and excess pulp, but it is simple to remove these with a sieve. Try playing with the speed settings to reduce foam and pulp reduction. Unfortunately, because this is a high-speed juicer, it does not extract the same amount of vitamins and enzymes as a masticating juicer would. Oxidation begins to break down the integrity of the nutrients in the juice more quickly. On the positive side, you can safely store it for approximately 24 hours in a tightly sealed, glass container in the refrigerator, but it is always best to drink it right away. 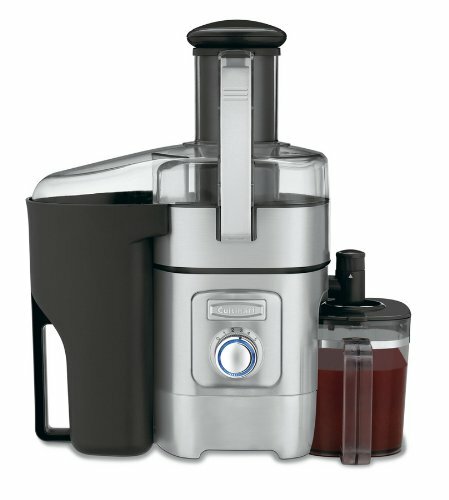 What Kinds of Produce Can Cuisinart CJE 1000 Juice? This machine will work best on hard produce, soft fruits and citrus fruits. Hard produce includes celery, beets, yakon, apple, watermelon, pineapple, sweet potato, ginger, carrots, pear, pumpkin, fennel, broccoli, cauliflower, turmeric, cucumber, bitter gourd, pepper, asparagus, garlic and cilantro. Citrus fruits include lemon, tangerine, grapefruit, orange, lime and mandarin. Using a low speed setting can process soft fruits such as blackberry, cranberries, mango, peach, pomegranate, strawberry, melon, grapes, tomato, kiwifruit, papaya and avocado to make a puree. Thus, it’s not advisable for juicing any of the following—spring onion, lettuce, spinach, wheatgrass, peppermint, parsley, pine tree needles, basil, collard greens, dandelion greens, cabbage, brussels sprout, beet greens, moringa, and kale. Considering the price of the Cuisinart CJE 1000 5-Speed Juice Extractor is only listed at just over a hundred bucks among popular merchants. It is a fine machine for the price. If you’ll look harder, you can get an even better deal on a certified refurbished model. If you’re really into high-speed juicing machines, CJE 1000 is a great Breville alternative. Not only does it help you juice a wide variety of produce but it’s also an affordable juicer with longer warranty coverage. I guess Breville can’t compete on their 3-year warranty promise. It is truly worth your every penny.